Provides a 250 kHz to 3 GHz frequency range. Five frequency range options are available to choose from, extending from 1 GHz up to 6 GHz maximum carrier frequency. This provides ample resolution to configure the ESG to meet your specific test requirements. 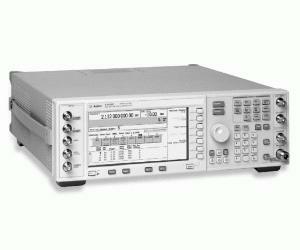 When combined with the N5102A Baseband Studio digital signal interface module, mixed-signal testing with digital and analog baseband, digital and analog IF, and RF test stimuli are all easily realized. Option 503 is recommended for test cases that require baseband and RF test signals at or below 3 GHz carrier frequency. Common uses include the generation of receiver test signals in the cellular and ISM frequency bands, including W-CDMA, cdma2000, and Bluetooth. In addition, test stimulus generation for various components used in wireless communications systems transceivers, such as ASICs, DSPs, ADCs, DACs, up/down converters, filters and power amplifiers is easily achieved.